Staying in love long-term takes intentional action every day. It doesn't have to take a lot of work, but by keeping these things in mind you'll be a dream partner to your sweetie(s). Strong relationships are based on trust and accountability. Being a great partner means owning when you've hurt someone, taking accountability, and moving forward. Try apologizing with more clarity next time (here are a few tips). Most conflicts could be resolved if we just slowed down and thought things through before reacting. Take a breath before you respond from now moving forward and notice what shifts between you. If you aren't taking care of yourself you can't properly take care of your love. Period. Prioritize your self-care as a means to nourish your relationship. Stop and ask yourself, what one thing could bring joy or ease to my sweethearts day- and then do it. Maybe it's a love note, a clean house, or a special song no matter what it is we all like to enjoy a special treat once in a while. Surprise them with something new. Not all communication is verbal- having strong kinesthetic communication strengthens relationships too. Ask your partner what their favorite kind of affection is, and then follow up by doing it. Resentment likes to build up even without our partners' help. Notice when you start dwelling on negative thoughts, criticisms, or complaints you have about your partner and force yourself to think nice thoughts for each negative thought you're holding. When you're in conflict make sure you take your partner's feelings and ideas into consideration. Couples who can perspective-take stay together longer- and experience greater sense of being "heard". Often as a relationship grows we forget to tell our partners the things we love about them- specifically, in person, and with words. Take the five seconds to nourish your relationship right now- just tell them why you love them. Strong couples share genuine appreciation and gratitude regularly. Start a daily gratitude practice and share something you're grateful for to help you stay close. I've asked clients to practice gratitude for years and those who have experienced greater success in our work together. 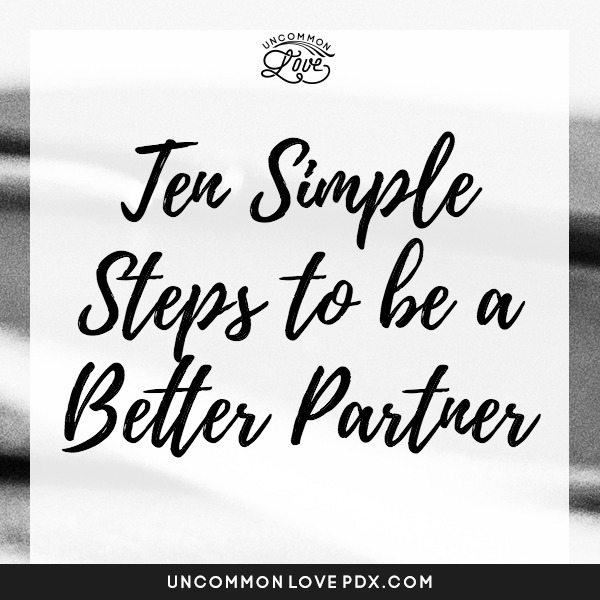 I hope these suggestions help you create a partnership you love. Let me know if you'd like help reinforcing your connection. I'm always here to help!